And what better way to end the evening than with a visit from our new friend, Sam! 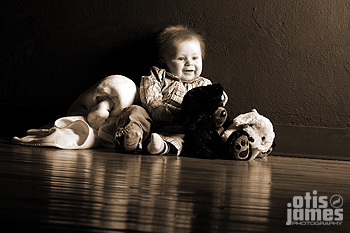 This young man, along with his entourage (Ma & Pa, respectively) came to warm confines of the Super-Studio ready for some sweet sweet six month pics! Sam was a treat to work with, as were his ‘people’ – I think he’s gonna keep them on payroll. We would like to extend a big ol’ Otis & James Thank You to Sam & Peeps for making the evening a little brighter for us, and we would now like to get to some supersnaps (that is now one word) – Enjoy! What great pictures of Sam! He sure is a cutie. Sam is just precious; what a combo of Mom and Dad! Sam you’re such a punkin I could just eat you all gone!! I told your mommy this on the phone and she said she tries. We both agree you’re something special and I’m so glad your mommy shared your pics with us. Otis & James did a fantastic job! 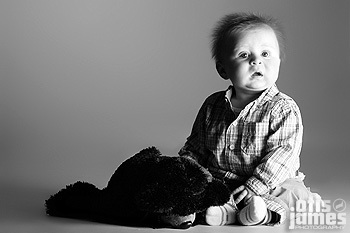 Sam is such a cutie and the pictures turned out great! I can’t wait to see the rest of them. What great pictures. They show Sam’s wonderful personality and he is super cute!!! Sam is absolutley darling, the pictures are awesome!!! Next Next post: All MHS Prom is Up & Ready!